Farm Fresh. Pure, natural, nutritious. Nourish happiness. 100 % Canadian. Fluid goat milk tastes so delicious. Most people say when they try goat milk for the first time "Oh wow, it tastes just like milk!" not expecting a clean, fresh taste with no farm animal flavours. It's definitely not "goaty". There are many differences between goat milk and cows milk, like the colour, goat milk is pure white whereas cow milk has a slightly yellow tinge to it. The nutritional profile, structure and composition differs too. Did you know that the fat in goat milk does not get stored on the body as body fat but is used for energy production? For more information on goat milk nutrition, composition and health benefits visit our education page. To enjoy goat milk at its best, serve it as cold as you can, and never let it reach room temperature. Goat milk is very sensitive and can sour quickly. We don't add anything to our milk. There are no synthetic vitamin fortifiers, milk proteins, additives, hormones or antibiotics. 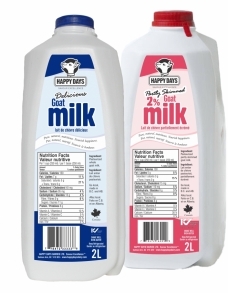 Happy Days offers 100% Canadian, pure and natural Whole Goat Milk in the 2 L and 1 L size, a 2 % Partly Skimmed Goat Milk in the 2 L size. You can find our Whole Goat Milk in all major grocery stores between Vancouver Island and the Manitoba/Ontario border and the 2% and Skim Milk in select grocery stores.